Operating with “samples” from modern cultural history, Bettina Samson conceives protean works that appear as condensations in which references and eras superimpose themselves and sometimes even enter into collision. Working with diverse materials, Samson’s second solo exhibition at Galerie Sultana emphasises a return to craft through a body of work oscillating between shape and the shapeless, abstraction and the figurative. Whether “crude” or modelled by artisans, the present shapes mostly recall motifs associating reversibility and looping. Intersecting anthropology, mathematics and fictions, they proceed to a sculptural experience that implicates new gestures without excluding coincidences. Simply placed against one of the gallery walls, the work Klein Bottle for Blowgun (after Lévi Strauss) now known as Three Loops for a Fourth Dimension consists of a steel structure covered in resin, sand and pigments which give the work a clay-like appearance that accentuates some artificial creepers added following the work’s time at the Jardin des Plantes (Fiac 2011). Made up of three continuous loops, the work derives its origins from the figure of a Klein bottle that appeared in La Potière Jalouse (1985) by Claude Lévi-Strauss in which anthropology appropriates this most singular shape with the view to illustrating the structuration of certain South American myths, translating the continuity of spatial, internal and external functions of the body. 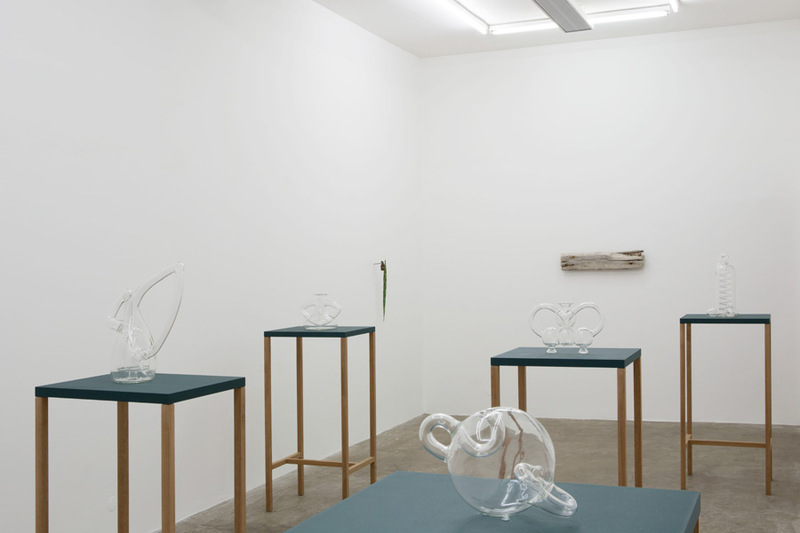 Alongside, Mètis & Metiista, a previously unseen series of five transparent misshapen then blown glass borosilicate sculptures are displayed , inspired by the variation of Klein bottles made by the British scientist and glass-blower Alan Bennett that were exhibited at the London Science Museum. Described for the first time in 1882 by the German mathematician Felix Klein and closely linked to the Möbius strip, the Klein bottle shows in topology (1) one single closed borderless and non-orientable surface: the inside becomes the exterior and vice-versa, in this way seeming to integrate a fourth dimension, passing through itself. Between improbable alembics for distillation and anthropo-zoomorphic artefacts of an unidentified civilisation, these pieces of glass display the most transparent of syncretism, reuniting the topological form of the Klein bottle, its representation in three dimensional space experimented by Alan Bennett and the analogy effectuated by Claude Lévi-Strauss in his study. They summon a body of representational fields (and of appropriations) ranging from alchemy to mathematics passing via anthropology and even – not without a touch of humour – modern abstract sculpture (Max Bill, Henry Moore). By some cunning trick (mètis in ancient greek), the artisan’s know-how called upon by the artist (metiista in Esperanto) literally gives form to these objects embodying metamorphosis, as much through the contortion of materials to behold as in regard to their fabrication process, implicating diverse manipulations and transformations. Evoking some bicephalous “topsy turvy” creature like the figure of the Trickster theorised by the anthropologist Paul Radin, and prolonging notions of reversibility and infinity to the work with the Klein bottle surface, Mishigamaw (Trickster), a floating piece of salvaged wood and grafted with “teeth” of native copper suggests the passage of time and its effects on the material, which – according to an upside down entropy movement- recovers its original state, hence operating like a sort of temporal loop. Mixing nature and artifice, science and fiction, upside down and right side up, Bettina Samson’s works presented in this exhibition reflect an ambivalence, even a paradox and only this ambivalence could illustrate the photograph Night Blooming Cereus an image scanned from the cover photo reproduced on an issue of «The Desert Magazine» dating from 1940 of a Cereus greggli flower in bloom. Or how, via a technical procedure implicating light, can you immortalise the flower of a desert botanical (cactus) flower species that opens at night, one single and unique time per year before closing up again to die.